NEW DESIGN FOR 2017 WITH A REPLACEABLE INSERT! 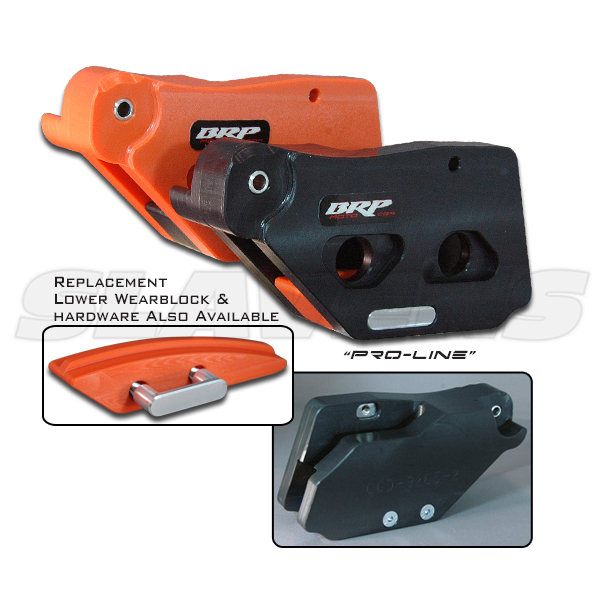 The “Pro-Line” chain guide has been redesigned to improve chain guidance and reliability when riding in extreme conditions. The BRP Polymer Chain Guide offers Increased Strength, Superior Durability and Improved Performance over OEM and other chain guides and now available in Black with Red center insert. Our “Polymer” Chain Guides are CAD designed and CNC machined using UHMW-PE polymer material. Thanks to its extremely low coefficient to friction, outstanding abrasion resistance, exceptional impact resistance, and self-lubricating properties, UHMW-PE is ideal for getting you through the gnarly stuff and is able to absorb a hit without bending like OEM or other aluminum chain guards.